I was looking the other day at my soup recipes and realized that most of them are low fiber. So, I thought I needed to add to our diet more soups that are both yummy and high fiber. 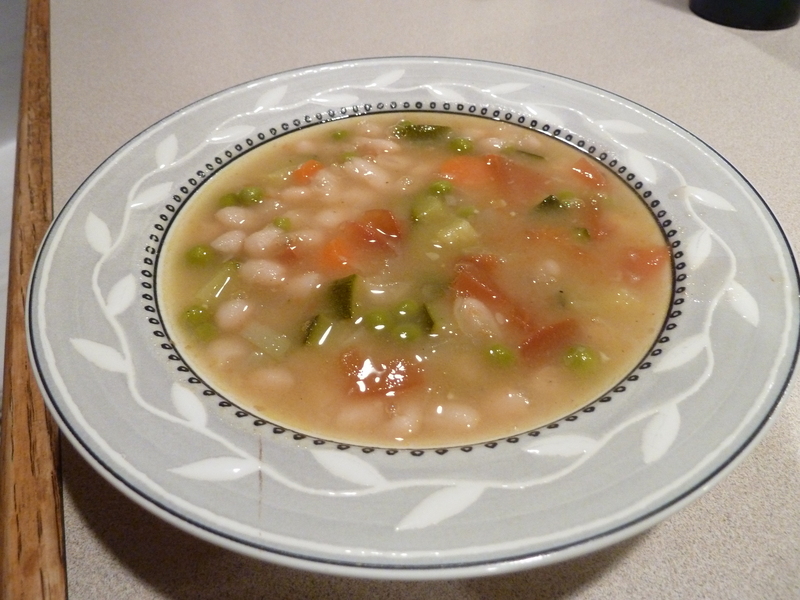 This vegetable soup with lots of beans and peas fits the bill. The quick version is to use canned Cannellini beans and frozen peas but, of course, you can prepare the beans yourself and use fresh peas instead. How to make: In a large skillet, heat the oil and saute the onions for about five minutes. One minute before the onions are ready add the garlic. Add the carrots and zucchini and cook until tender. In a big pot, bring to boil 10 cups of water or combination of water and chicken broth. Add the sauteed veggies, peas, diced tomatoes and the cooked Cannellini beans. Cook for half an hour and serve. Notes and tips: To prepare uncooked beans, soak them overnight and cook them in water until they become tender. For a stronger taste, instead of heating oil, you can cook 4 slices of bacon. Remove the bacon from the pan when it’s ready. Use the fat from the bacon to saute the onions and the other veggies. Crumble the bacon and add it to the pot with the other veggies.